Tabitha’s neighbor friend has a Leap Pad. Naturally it became a much hoped-for Christmas gift. She did receive one and has spent quite a bit of time with it. The Leap Pad comes with a few standard apps. One of these is a drawing app, called Art Studio. Tabitha (6 years old) has drawn many pictures on it. This is the sort of thing I’m talking about. And I wondered whether I could get some math out of it. See, there is a paint bucket tool in there. 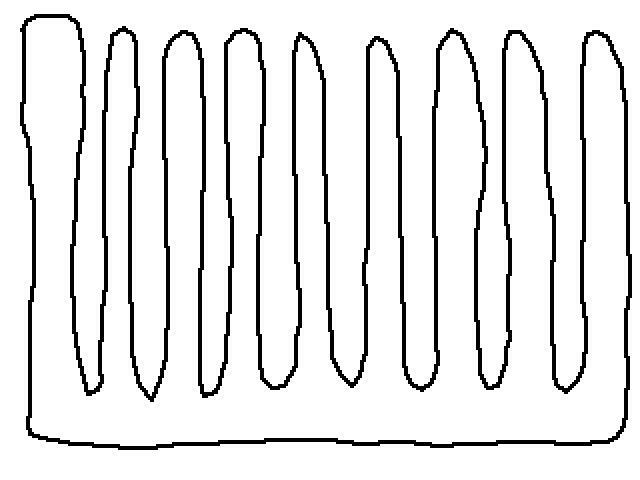 When you apply the paint bucket, the paint fills up your drawing, but it doesn’t go across lines you have already drawn. So if you draw a square, you can paint the inside of the square and the paint won’t leak out. Or paint the whole screen outside the square and the paint won’t leak in. Unless you leave a small hole, in which case, the whole screen gets painted because the paint leaks through the hole. I showed this feature to Tabitha and proceeded to draw some complicated curves, asking her to guess where the paint would go. 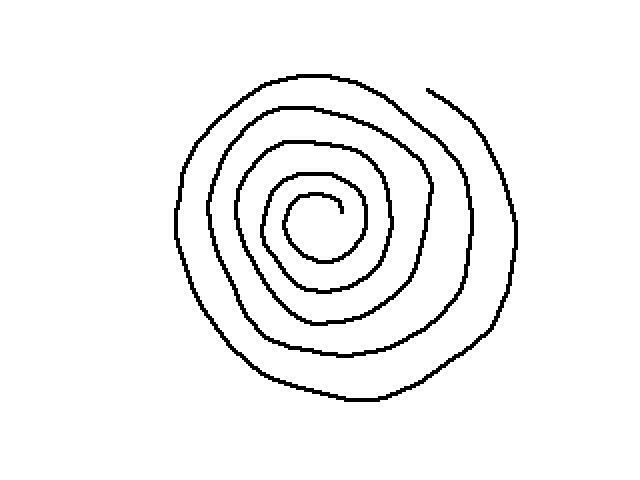 For example, I drew a spiral. This was no problem for her. I asked her how many colors we could use to paint some complicated curve pictures if we used a different color for each section of the drawing. I had her draw pictures and make me guess. I was busted. I had to take a time out and let her just play with her toy. But then, going back and looking at her more recent art, I can see I got into her head. Don’t worry, though. The horses are still making appearances. 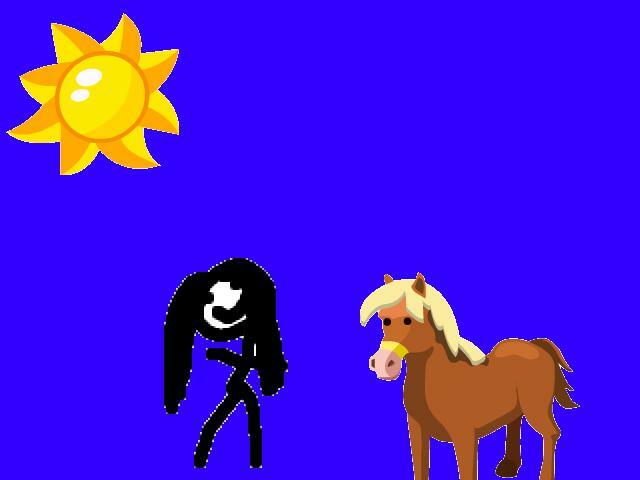 So if you have a Leap Pad in the house, I gladly give two-hooves-up for math in the Art Studio! 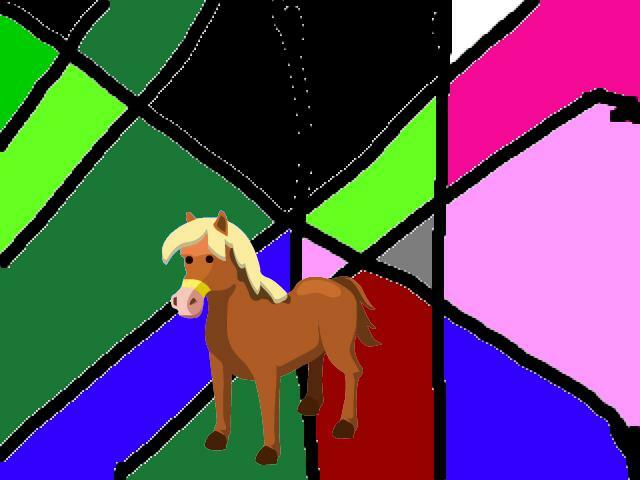 This entry was posted in Product review, Shape and tagged 6 years old, apps, art, leap pad, regions, Tabitha, technology, topology. Bookmark the permalink. Haha! Another great line. I’ve been fairly disappointed with the expense of the Leap Pad Games. However, I did look into nerdy science games when my son first received it, and I did purchase Splurgle. We love it! You have to change this water drop’s state of matter to match the obstacle (for example water can’t go over a storm drain, but it can as ice or to reach something up high, you turn water into steam/vapor). My 4-yr old is much more interested in our Android tablet than his Leap Pad. I recently found a few (free) apps that attempt to recreate the Apple IIe Number Munchers game. I haven’t played it enough yet to find out if they are as good as the original. The game is a little tough for 4 year olds (ie. asks for multiples and you’re supposed to be fast enough not to be eaten by a monster), but your kids might enjoy it. Thank you for this, Christopher. Maria has one of these and she likes the art studio. No offense to Bot and Geo, but I’d take this kind of math in the art studio over Team Umizoomi any day! Thanks for the tip. Our 4 yr old received one for Christmas as well. She’s been happy with some of the built-in stuff and has been playing a Doc McStuffins game until I want to lose my own hearing. I’ll look into this one as she loves to draw.